Dotdigital is a leading marketing automation platform with email at the core of what they do. Using email they empower marketers with the tools that make it easy to get top results, every time. Dotdigital provides its consumers with uniquely scalable, easy-to-use and fast email, social, mobile, design, management and reporting features to improve their client’s productivity and drive ROI. SaleCycle’s partnership with dotdigital allows clients to deliver contextual, personalized emails in-line with your other email marketing efforts. Our direct integration with dotdigital means clients can quickly implement their remarketing campaign to fit seamlessly into the customer journey. 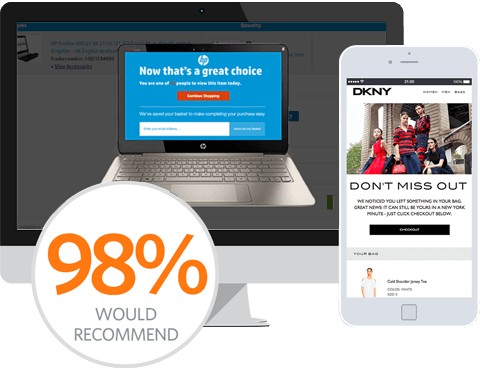 By using the data learnt from user’s previous actions, clients can deliver relevant, personalized real-time remarketing emails through the dotdigital platform. The result? An email campaign which enhances the customer journey providing clients with increased conversions. Send dynamic email content that integrates into your other email campaigns. Manage all your Email touch points from one system. Create and send relevant, personal and timely communications with the right content.